If you keep a good stock of medical supplies on hand, many minor accidents and injuries such as a sore throat, cough, grazed knee or hangover can be treated at home. 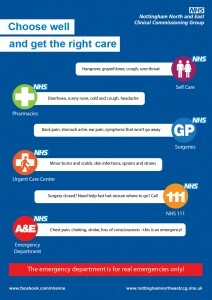 If you need medical advice quickly, call NHS 111. Available 24 hours a day, 7 days a week, when you call NHS 111 you will be assessed, given advice and directed to the local service that can best meet your needs. An out-of-hours GP service is available for illnesses and injuries that cannot wait until we reopen after Easter..